Havera melhor maneira de terminar o dia? 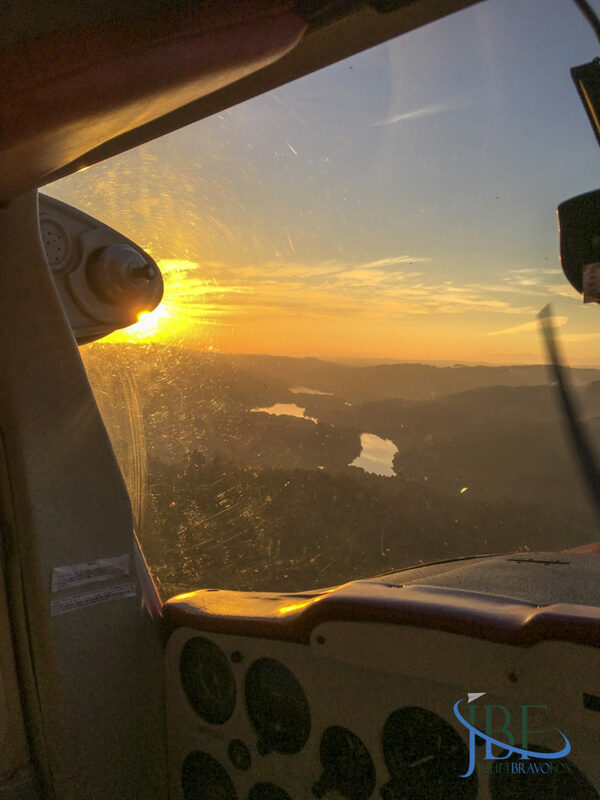 “Is there a better way to end the day?” A rhetorical question when you’re flying just above the ridges in a cosy Cessna 152, turning circles to collect the sunset inside the little cabin. Rafa has just shown me his favorite local flight, dipping down close to a barrragem, or reservoir, not far from the Aerodromo de Viseu in Portugal. These sorties are sweeter because they can happen with an ease you don’t find often in the more constrained airports around Portugal and Spain. An understanding allows for short flights to take place ad hoc, without the extensive flight plans normally required when you’re flying place to place around Europe. The Aéro Clube de Viseu (ACV) takes full advantage of this, and respects the privilege—but it causes me to shake my head. Most of my flying has been just as self-propelled, VFR, free from restriction, and wide open to serendipity—not the exception. Like the sun coming down over the Serra da Estrela, the highest mountains in Portugal. We have just enough time to hop in the 152, run up, clear for takeoff, and make a few 360s around the lake, the river, the capela on the hill. The air is butter smooth, and Rafa graciously gives me the controls. I get current in a handful of landings. Current enough for this, I believe. ACV has been flying for more than 50 years, with its foundation on March 16, 1966. 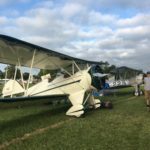 Today, it includes the informal extension of the no-longer-active EAA chapter, with several members shepherding homebuilt projects, and a flight school. Prominent among the experimental aircraft on the scene: the first Sonex to take its birth-flight in Portugal—a bright yellow bird proudly flown by its owner-builder, rumored to be the past EAA chapter president. The aéro clube has its own aircraft as well—the 152, used for private pilot instruction, and the Portuguese-built LAND Africa for ultralight pilots. 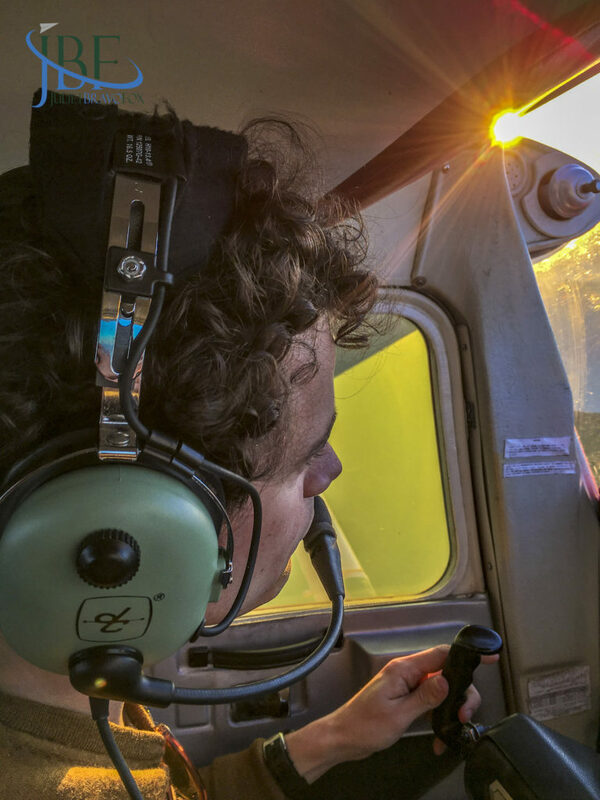 A course for an ultralight certification (allowing you to fly an aircraft up to 450 kg under the program) runs about €3,500, reflecting the lower fuel costs and total time required for that certificate. A private pilot license will take about €7,500 of investment. 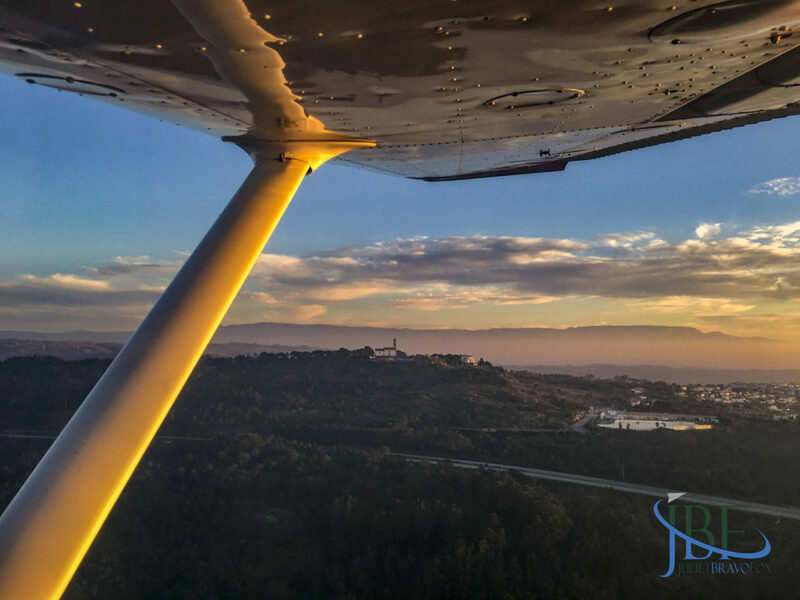 When you consider the low cost of living in north central Portugal, the generally good weather, and the open airspace, it could be a great deal for a prospective pilot seeking something different. 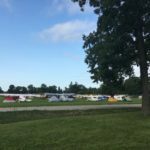 For most ACV members, though, the club’s primary feature is its social fly-out calendar. 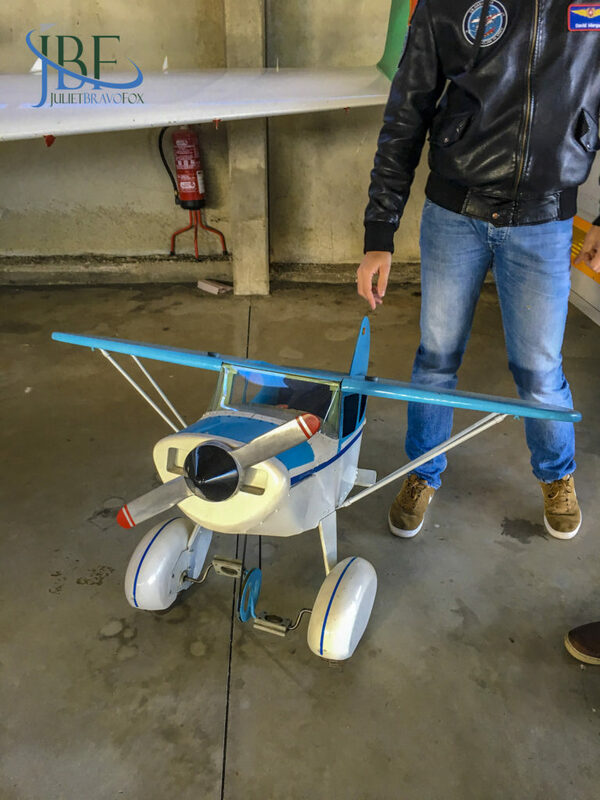 Every month during spring through fall, the club finds a place within Portugal—or as far afield as southern France—to take a gaggle of airplanes and spend a few days in the air. Recent trips have been to a fly-in ranch in Alentejo, and a summer trip up to Carcassonne, France. Of course the little ones need inspiration too! 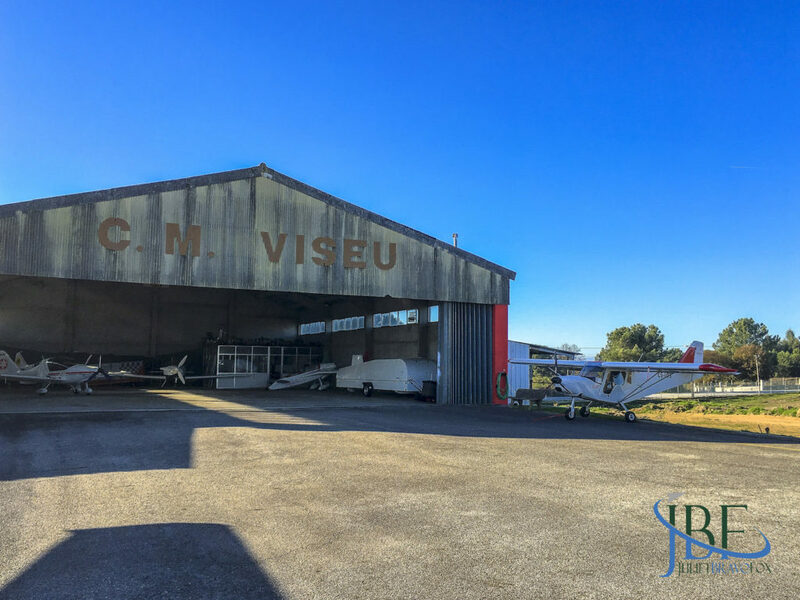 The airport at Viseu hosts internal airline flights, firefighting operations, and powered parachutes. It’s an eclectic mix—and a tenuous balance. 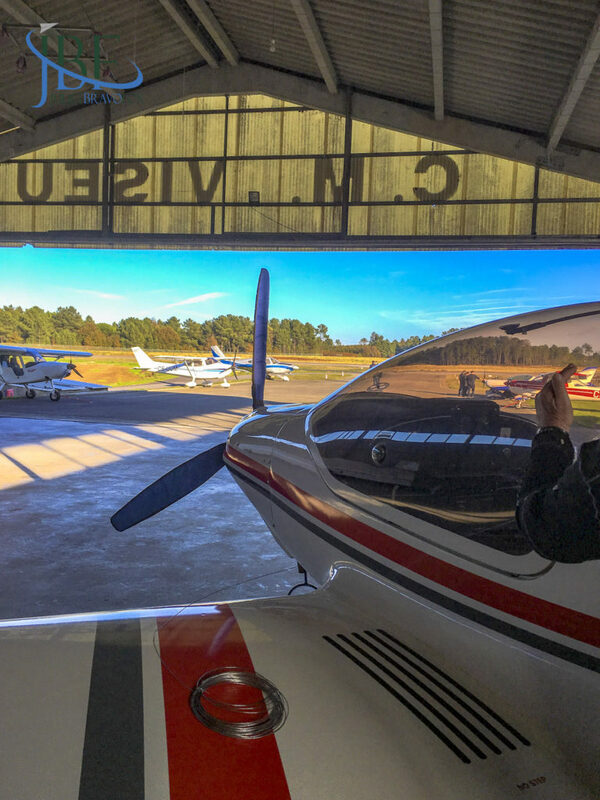 Some would have the general aviation side disappear completely in favor of more commercial aviation, though there is not yet the population base to support much more than what is offered. The threat of change keeps everyone focused on flying as much as possible in the meantime. As the days grow longer and the sunsets deepen into choral oranges and reds over the mountains, it’s easy to find excuses to just go fly. We’d traveled to Santa Monica on the day before, to celebrate the 75th anniversary of the DC-3’s first flight. Because the weather on the actual day, December 17, 2010, threatened low clouds and rain, we planned to fly with a friend in Betsy’s Biscuit Bomber, a C-47 based in Paso Robles, on the afternoon of the 16th, from the Santa Monica Airport at 3:30 pm, to match the time that Carl Cover first took a Douglas Sleeper Transport to the skies in 1935. But we had time to kill—a dangerous thing for a pilot crew—so I told my pals Dan and Matt that we’d drive down San Vicente Boulevard, so that we could see the house that Donald Douglas had designed and built, in 1927, for his family. Well, what we *could* see of it, hidden behind its long stucco walls. We parked and walked along the sidewalk to the front gate, which had been braced with the Olde English style lamps that Doug favored. I peered through a crack…you couldn’t really see a thing from the road. “Should we see if anyone’s there?” said Dan. I hesitated. It never occured to me to ring the bell, to disturb whoever lived there. But it was early afternoon on a weekday—so in my mind, no one was likely to answer. But someone did. And introducing himself as the house manager, the man asked what we wanted. Dan told him we were in town to celebrate the DC-3, that we knew the house as Doug’s own. And next thing we knew, the gate parted, opening onto a drive down which strolled Douglas, the kind estate manager, who offered to show us around. I was stunned, not believing our luck. Jim Douglas, Doug’s son, had told me that he hadn’t seen inside the house since it was sold, following his parents’ divorce, in the mid 1950s. We walked past the rose garden and around the back into the living room. The house was overjoyed with Christmas decorations, lending it a timeless, enchanted feeling. Douglas detailed the restoration work that the owner had completed—she was a native to the neighborhood, and most everything in the house was still original, as the only intermediate owner died without any money to remodel or fix things up. He introduced us to the kitchen, the dining room, and the lounge, complete with its own pine-clad bar set into the wall. He showed us where the fallout shelter had been, and where Doug’s shop once stood—it was now an intimate movie theater, where once Doug had built models and tinkered with inventions with his children. Finally, we stood in what had been Doug’s study, and I took in its somber, yet inviting warmth. I imagined his books lining the shelves—knowing that he kept special ones locked away in a hidden cupboard. I asked Douglas if he’d found it, and he smiled. Yes, and he showed us where it was—exactly where my eyes had been. It was the most logical place, but somehow, also, it made sense to me in a different way. I understood a little bit more that day about the man who led his company to create the DC-3. He came home to his study each day during those years between 1932 and 1936, when the development of the Douglas Commercial line hit full stride, and came to a milestone with the entry into service of American’s first DST in 1936. Douglas had set out a leather-bound folder on the desk, with Doug’s initials (DWD) embossed in gilt on the front cover. Inside were a series of professional photos, shot dramatically in black and white—they were staged for an issue of Architectural Digest that neither Douglas nor I have been able to locate. These were used to help the owner restore the home to its period state. But more so than that, they confirmed that where we stood resembled very closely the home in which Doug lived while the DC-3 came to life in the factory over in Santa Monica’s Clover Field municipal airport. I breathed in every bit of those rooms that I could, knowing that someday I would write more about this intriguing man’s life. That was eight years ago, of course. So this year, I’m proud to wish a Happy 83rd Birthday to the DC-3, and raise a toast to 2018 during which that biography, “Honest Vision: The Donald Douglas Story,” came to life. 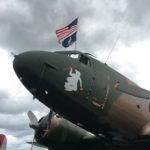 The Douglas C-47 Miss Virginia at Oshkosh 2018. Photo by Stephen Yeates. 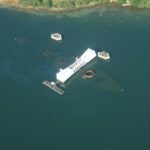 When I planned the scenic flight with the Cessna Pilot Center in Honolulu at the time, Flight School Hawaii, I didn’t put it together that our flight around the island of Oahu would bring us back over Ford Island, the site where the USS Arizona lies at its troubled rest. On this day, December 7, but 77 years ago now, the ship was sunk at anchor by the attack on Pearl Harbor by the Japanese forces. On that day in 2008, a brilliantly blue sky in January echoed the waters beneath us as the controller at Honolulu International asked us to hold over the island. With each turn, we circled the graveyard of hundreds of soldiers lost on that morning. The slow hold gave a chance to mourn from above–and to look out over the land, to see the inland pass over which the fighters slung themselves at an unsuspecting air station. Each time we pass another 7th of December, I remember. 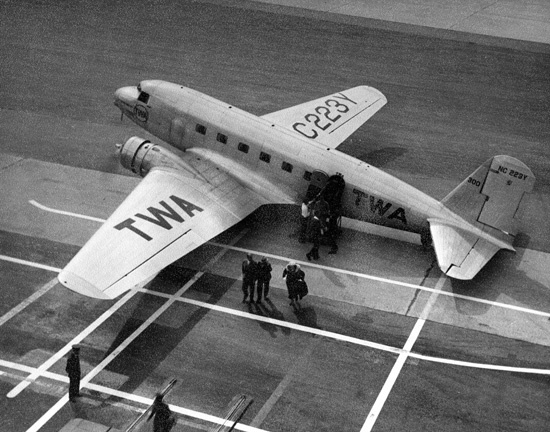 On October 29, 1938, a DC-3-227A, c/n 2054, rolled out of the Douglas Aircraft factory in Santa Monica, California, on a beautiful autumn day. Nothing of particular note on her entry into service–except for where she was bound. She’d soon be put on board the deck of a ship bound for Antwerp, Belgium, where she’d be reassembled and put into flying condition. 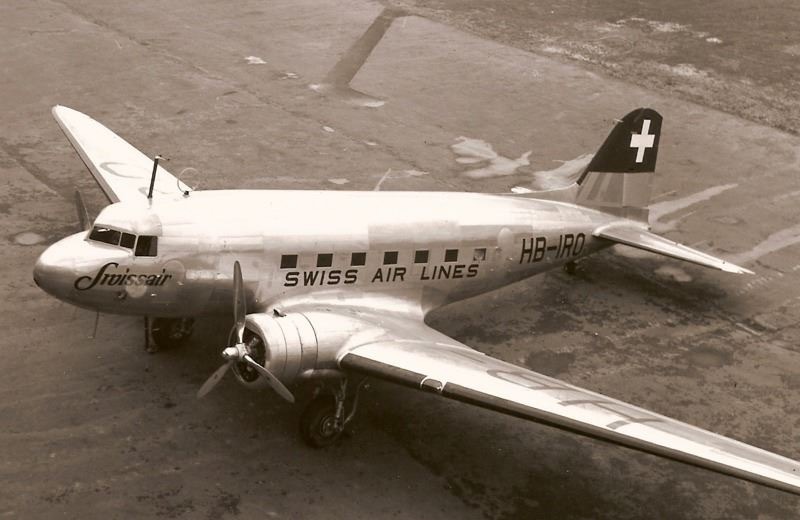 Reborn as HB-IRO, she’d fly for Swiss Air until the war shadowed Europe and she detailed to that effort. After World War II, she returned to the United States, where she flew as a corporate transport, until Ozark Airlines snapped her up in the late 1950s, and christened her “N143D.” She flew around the Midwest for several years, until she retired from airline flying in 1968. 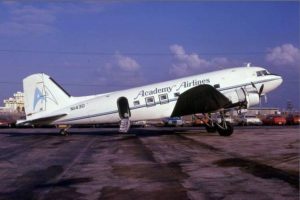 Academy Airlines, a cargo operation in Griffin, Georgia, put her back to work in the 1970s and 80s, and she trained new pilots to the joys of large tailwheel flying–and the life of the freight dog. 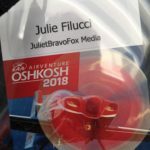 Since 2001, she’s had an easier life, back to training full time, then, beginning in the summer of 2017, providing lift for skydivers in Siloam Springs, Arkansas. 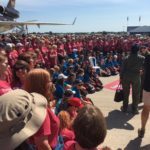 She visits airshows from time to time, sponsored by Gold Seal Ground Schools–but her favorite thing has to be showing kids what flying history looks like. You can read more about her story in “Together We Fly: Voices From The DC-3,” and more about how Donald Douglas led the team that developed the Douglas Commercial aircraft line in “Honest Vision: The Donald Douglas Story.” Happy birthday, Darla Dee! As a pilot, and a Douglas Aircraft Company historian, I have a special place in my heart for the Santa Monica Airport in California. Like many pilots and aviation enthusiasts, I have watched in horror as the city council has pursued the destruction of the airport. As a follower of the Santa Monica Airport Association, I received the following email urging action this weekend, as a critical and irreversible move next week could send the airport further into a death spiral. 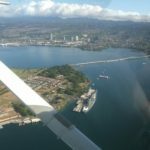 If the city proceeds with the removal of more portions of the infrastructure, I guarantee there is little hope that runway portion will ever come back. 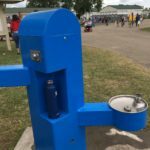 It’s a waste of city resources, and a short-sighted action. SMO NEEDS YOUR IMMEDIATE ACTION! EMAIL OR CALL THE SANTA MONICA CITY COUNCIL NOW BEFORE TUESDAY EVENING’S CITY COUNCIL MEETING! CALL 310-458-8201 – URGE THEM TO STOP THE RUNWAY REPURPOSING PROJECT! 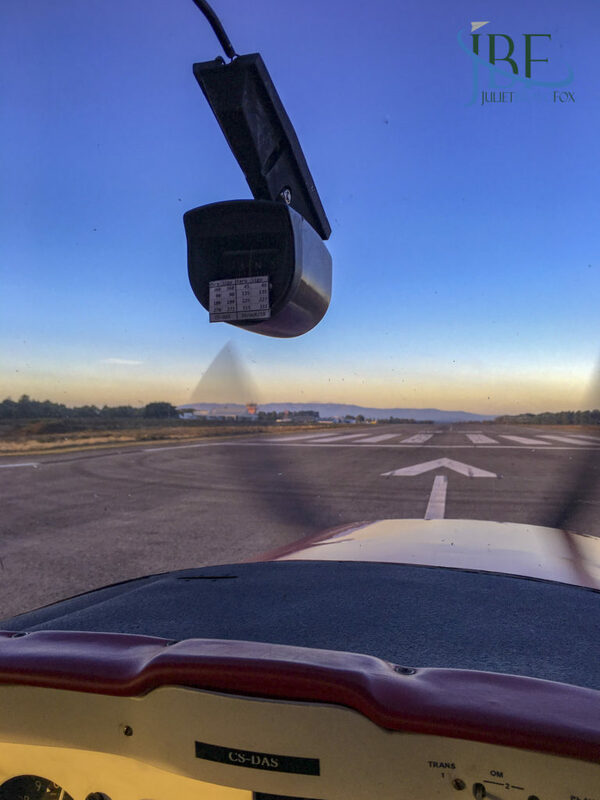 On October 23, the Santa Monica City Council will review bids on a project that would waste $4.4 million dollars of taxpayer money by unnecessarily removing existing pavement and safety overruns at the Santa Monica Airport. 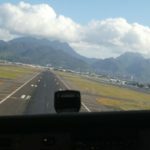 The sums they are spending are astronomical: The city has already spent $4 million to shorten the runway and over $36 million on legal fees to close the airport. Enough is enough!!! This latest plan will have ZERO benefit to the community. The larger jet operations have been curtailed by the shorter runway. This project would make the airport and its neighbors significantly less safe by removing paved safety overruns, reducing the airport’s emergency relief capability, exposing the community to toxic construction dust, and increasing bird strike hazards to aircraft by replacing paved surfaces with dirt and grass. PLEASE Contact City Council NOW, prior to the October 23 rd meeting and urge them to STOP the Runway Repurposing Project. E-mail council@smgov.net or call (310) 458-8201. SUBJECT LINE: STOP THE RUNWAY REPURPOSING PROJECT! We urge you to STOP the Runway Repurposing Project. This project will make the airport much less safe for users and neighbors and eliminate the ability of large relief aircraft to use SMO during a disaster. There is ZERO benefit in removing the pavement, in fact, to do so will pose serious safety hazards to the community. THIS MAKES NO SENSE AND IS A MONUMENTAL WASTE OF VALUABLE CITY RESOURCES! The airport is slated to close in 2028. While it’s open, there is no reason to spend millions of our tax dollars to remove pavement. Retention of the existing pavement maintains larger than standard safety areas and preserves the airport’s value in an emergency at ZERO COST. It is incumbent on you to run this critical facility responsibly and safely. Stop wasteful spending on projects that have zero benefit to our community. I’ve spent much of my aviation life with one foot in the future, and one foot in the past. Most recently, I spent a year and a half working with new pilots just starting their studies towards an airline transport pilot’s license, young people from all over the world, in a new country (to all of us), fighting to perfect their English along with puzzling through General Navigation—one foot in the future, one foot in the past. 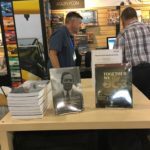 At the same time (along with a team of real aviation history geeks), I brought into life the biography of a man, Donald Douglas, who changed our world a hundred years ago, as he graduated from the dewy-new MIT to establish the Douglas Aircraft Company and build the iconic DC-3. As I continue to field DMs from students, as they struggle and succeed, and as I read news every day of the latest innovations trying to solve our questions of future propulsion, economy, and environmental care—I can’t help but be struck by the parallels back to similar questions Donald Douglas grappled with in the 1920s and 30s, as his wily band of engineers competed, collaborated, and convinced a wary public that flying around the world was not only possible, but safe—and should be something we must keep doing. Clearly that general public took the bait, because we’re still building airplanes, we’re still needing pilots, and so much of the world’s commerce can happen because it’s possible for me to get on an airplane in Lisbon this afternoon and be in Singapore 26 hours later (with a few hours cooling my jets in Dubai). 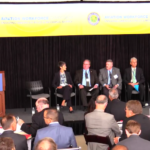 A couple of weeks ago, the FAA hosted a symposium in Washington, D.C., seeking to loosen the hairy knot that’s choking the development of the aviation workforce. Because we live in a connected world, I participated in it livestream from my couch via Facebook. After conceding that the opening panel reflected the current state of affairs (and politics)—and deftly illustrated that we haven’t yet tackled diversity in our upper ranks—I was encouraged as the day moved on with a variety of thoughtful leaders from around the community floating up idea balloons that deserved more time than the space provided. 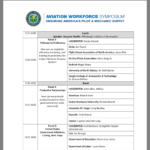 It reminded me of the similar Pilot Training Reform Symposium hosted by SAFE (Society of Aviation and Flight Educators) in Atlanta in May 2011. At that conference, we outlined a host of problems to address. Coming off of the worst recession many of us had witnessed firsthand, we discussed the lack of student starts, drop in aircraft sales, and diminishing flight hours all around that hung a dark cloud over the industry—but we were determined to fight these issues. 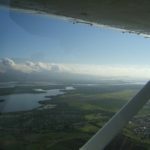 The ideas that came from that 2011 event (increase flight instructor professionalism, revamp the testing process, find new ways to market to the next generation) felt solid, but only through the collaborative effort between industry, government, and user groups did we come up with real change. Regardless of how you feel about the new Airmen Certification Standards, they reflect the substantial transformation that can happen when folks set aside their fiefdoms and work to create something new. 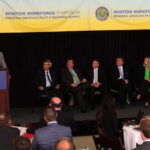 And that was the overall message I heard from the Aviation Workforce Symposium this September. We have a new landscape, with airlines around the world clamoring for personnel—not just pilots—and willing to pay for training and better wages to bring them on board. Turns out that when the real pain strikes you, what was once a nagging ache turns into an emergency you must address. 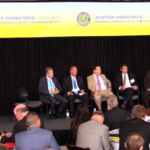 At the symposium, the people who found success in recruiting diverse new entrants into the aviation community (be it pilots, technicians, or the host of support personnel making airplanes fly)—these folks brought up repeatedly the partnerships that had energized the process. The collaborations make it happen. Case in point—and one I can relate to, given my recent experience: Students that have come into our training programs in Portugal typically do not have the same experience with the mechanical world that I had as a teenager. When I turned 16, more than 30 years ago, I had a car, and I learned how to change a tire, and an air filter, and the bulbs for my headlights. Today, even in the U.S., where a similar teen could also have access to a car, it might take dropping the entire front end of the car to get to the headlights—we’re so advanced, we’re no longer meant to service our own machines. As for the young people I’ve mentored in the last two years: They not only may not have ever driven a car before coming to Portugal—some have never ridden a bicycle. It’s far from a lack of intelligence (that same kid could build an app for my iPhone), but a difference in exposure. At the same time, the airlines need more relevant skill in their initial candidates, though there may be less skill coming in the front door, a point brought up by several voices at the symposium. We fiercely need to innovate and collaborate to attack this lack of exposure. If the flight school, and, subsequently the airline, notes this lack, and in partnership brings training into the high schools, we can solve this pervasive problem—and at the same time the industry gets to take advantage of the inherent marketing that occurs when a child encounters aviation in a natural, practical, relevant way. We innovate in aviation in a stunning variety of ways, and I feel in my bones we’ll address our issues about fuel, noise, cost, comfort, and safety through evolutions we can’t yet visualize. The first flight around the world, in the Douglas World Cruisers in 1924, resulted from the innovation of the new aviation industry, backed by the support and investment of the Army Air Corps. Doug had witnessed the ineffective (at best) way government worked when unchecked, through his year with the Signal Corps in World War I—but he also knew that serving the greater good through this government contract could have a large financial payoff for his private-sector business. I’d like to see the action list resulting from the Aviation Workforce Symposium—and determine the project to which I’ll sign my name. If each of us does the same, we can direct the innovation to address our problems. One action item we can each put into play? Take a cue from entities as diverse as Boeing, Redbird Flight Simulations, and AOPA, and—using the work they’ve done in creating STEM curricula and other programs—help them find traction in our local schools and youth clubs. Supplement this greater action with other gestures to enhance it, such as donating materials and subscriptions to a local youth program or technical college. 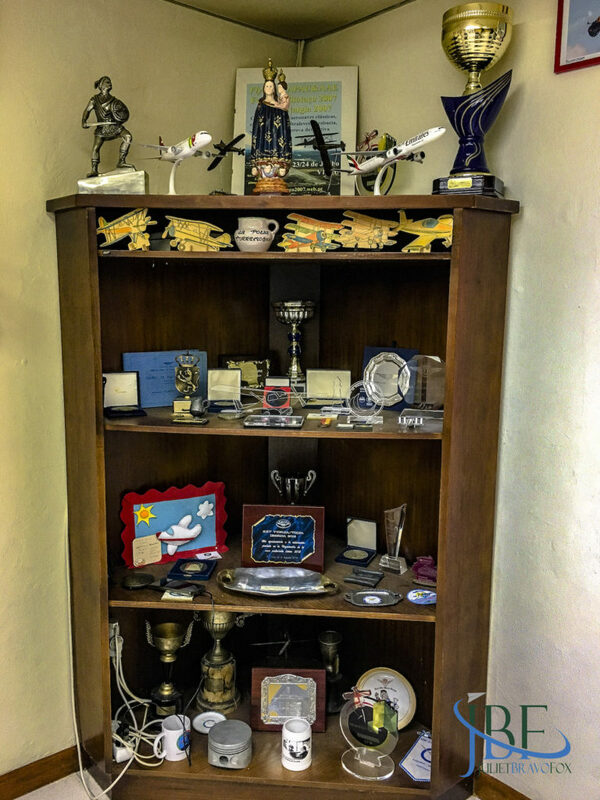 My personal action has been giving support to our local air museum, and mentoring past students (our diverse “flock”) as they navigate their own specific course to an aviation career. Parallel to this? To counter any lack of opportunity, purposefully seek out young people who wouldn’t otherwise get a ride to the airport, and go to them where they are—maybe that kid isn’t watching airplanes from outside the fence because he or she can’t physically get there. Collaboration wins, but it takes each of us to move the needle forward. 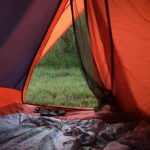 The early evening light shone into the tent, making the old orange nylon glow. 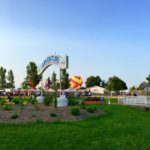 It was appropriate to be there at the campgrounds of Camp Scholler in the first tent I ever camped in—my family’s tent from 40-plus years ago—for my return to Oshkosh au naturel, more than 20 years since I first put down stakes there. 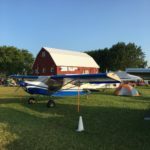 It turned into a homecoming, and a new experience at the same time: My partner in crime, Stephen, celebrated his first Oshkosh ever during the 2018 show. He had an excuse: He’s a Brit. So we were both like kids returning to our more innocent years. And it turned out Scholler was a perfect place to do it—hard ground, busy showers, bugs, and all. We rolled in around 6 pm on Tuesday, which meant we secured one of the last tent spots for the taking. Seriously, when we located our home for the next four nights, we looked around for the south boundary fence and found it just a few yards away. That made me happier than you might think: It meant that Scholler was FULL! My guess was verified the next morning at the media briefing: Not only was Scholler at capacity, the aircraft camping filled up as well, even given the new extension, the South 40. More happiness. To have so many folks there, spending days or the whole week, and (most importantly) flying in, that made my heart sing. 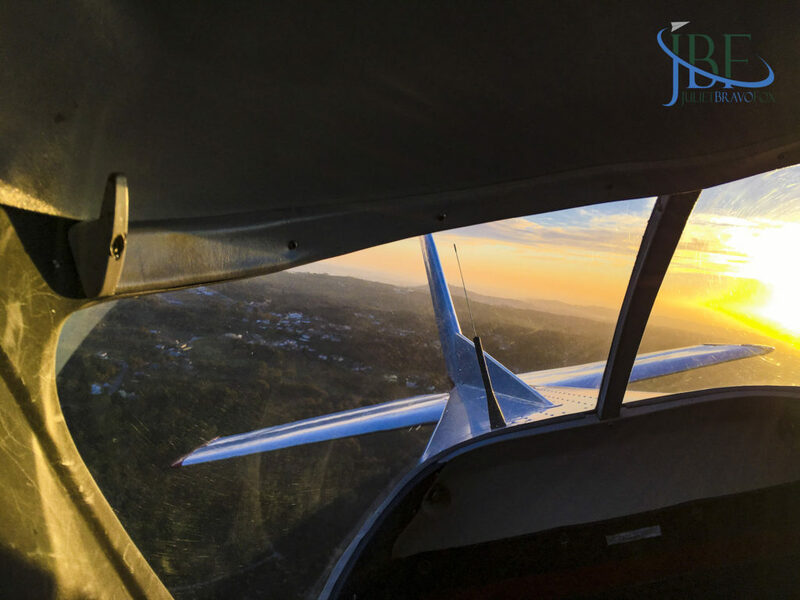 It’s a solid indication that our general aviation industry retains a shine, perhaps returning to full health after a decade of rough years. 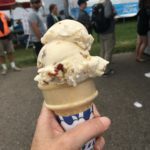 So many elements go into this hope, as I found out over the course of the week at EAA AirVenture. Innovations took top billing, with forums and showcases and lots of attention from all sides. 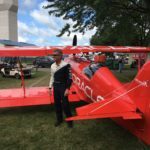 Old friends met new ones: Both the warbird and classic rows featured new faces, and the homebuilt areas were packed. The venders with whom I compared notes said business was good—a solid showing at least. More satisfaction. And the weather…nearly perfect. Does that ever happen? Okay, so, Wednesday eve we ducked out of the pouring rain around dinnertime, and feared what we’d find at the campsite. A moat? A stream? Water cascading through our tent? We lucked out. We’d picked a bit of ground that sat ever-so-slightly higher than its surroundings. And with the exception of one dumbass move (leaving the vent window unzipped), we stayed dry through that single night of showers. But the best part of camping was the people (aside from opting out of the morning traffic jam coming into the grounds). 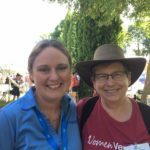 After our early morning showers and reasonably giant coffees from the canteen, we sat outside and talked with newbies from around the country—and the world. Everyone gave off a kind of quiet joy that’s impossible to fake. If we were a bit worried that we might find politics a problem, our concerns faded quickly. It was as if everyone silently agreed to keep our differences outside of the airport boundaries. We had enough common ground to focus on that the divisiveness fell away. It had no place. Let’s make a pact to carry on that spirit of camaraderie, shall we? We could wind up solving our problems rather than letting them grow intractable. It felt as though general aviation has started to use its collective will in this way to renew itself, and move forward. 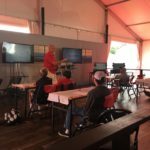 For a first-time visitor to Oshkosh, what I’ll call the “Spirit of Scholler” demonstrated best what GA in the United States is all about. 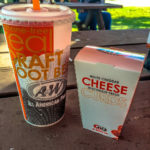 For a longtime avgeek returning home for that annual visit to Wisconsin, it made me feel so full of hope. Such a thrill to have Honest Vision join Together We Fly on ASA’s display! A palpable sense of honor hangs in the air of the voluminous display hangar at the Sintra Air Base in Portugal. Just north of Lisbon, the air base hosts the nation’s air force training academy, as well as its flagship museum, the Museu do Ar (Museum of the Air, in Portuguese). Within the main hangar and its neighbors, hundreds of noteworthy, historic, and inspiring aircraft stand waiting to help inform the curious—and the young—of the history of aviation in Portugal, and its influence on the world. Though those outside Portugal often equate its exploratory prowess with its efforts on the seas, its forays into the air—and the annals of history—began in the early days of aviation itself, and grew to prominence in the golden age of aviation, before World War II, and post-war, as Portugal used airplanes to tie together its former colonies in Africa. You may not know, for example, that the Portuguese were among the first to cross the Atlantic—years before Lindbergh’s solo flight—as they sought passage to Brazil from Europe. In fact, the aviators Gago Coutinho and Sacadura Cabral made the first crossing of the South Atlantic in 1922, flying in segments from Lisbon to Rio de Janeiro using three different Fairey III biplanes. But among the museum’s proudest airplanes, looking over all of its fleet, my pick must be the Douglas C-47A Dakota. 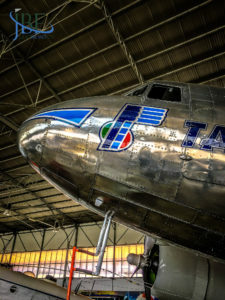 She forms the center of an exhibit that not only tells the airframe’s story, but also the story of TAP, the airline of Portugal, and those that flew her. 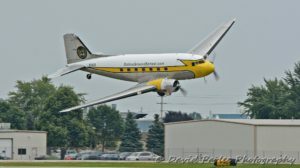 When a group of volunteers looked around for a Douglas DC-3 or its equivalent military model to restore in honor of TAP’s 70th anniversary in March 2015, they couldn’t find an example that had actually flown for the airline. All had been withdrawn from use or otherwise lost. Instead, the group found the C-47A used by the DGA (Direcção Geral de Aviação), the former authority governing aviation in Portugal. Its Douglas construction number, 19503, last carried the registration CS-DGA. 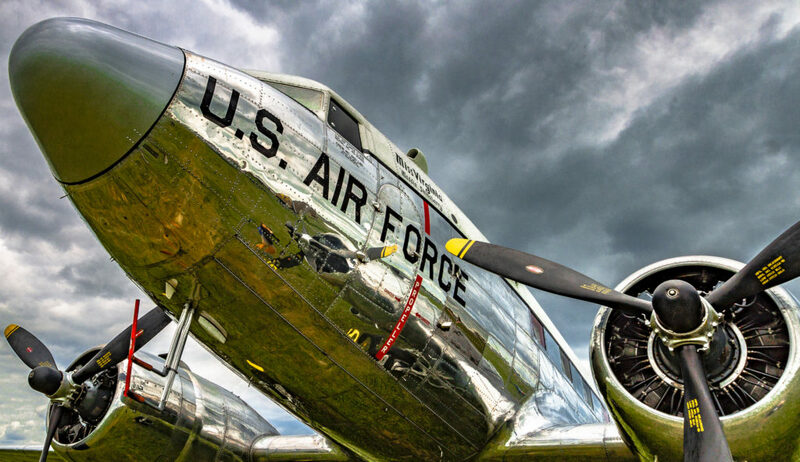 To reflect the dual purpose that the airplane would have in the museum, the group decided to give her two faces: one, the airmarkings of the DGA to suit her original mission, and the other, the classic TAP livery, to glorify the history of the airline. On the TAP side of her tail, she carries the registration CS-TDE to signify “Transporte” “Dakota” and “E,” the fifth letter of the alphabet, as she was refurbished to resemble the fifth airplane in the TAP fleet. Inside and out, a team led by current TAP captain Carlos Tomaz bestowed great care on her refurbishment. Tomaz would dearly love to return her to flying status, but for now she serves as an educational platform and living part of history central to the museum. Periodically, the group hosts “Dakota Talks” to share stories from her past, and those of the other DC-3s and C-47s operated by Portuguese airlines, military, and governmental agencies.